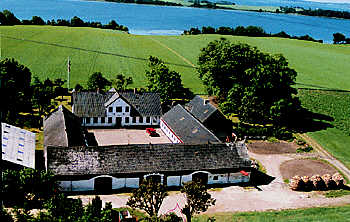 Kathrinelyst is an old family farm that once in the middle of the 1800s was built here on a little hill, with a great view of Gamborg Fjord and little belt surrounded by good farmland. The farm stands with its tree-lined avenue that is a romantic getaway in an otherwise busy life, ready to take care of its guests. Here the deers walk quiet around both in fields and gardens. Reynard the fox ventures past early in the morning, and nature make themselves known with both pheasants and hares quickly dashing across the field. for a beautiful evening with picturesque twilight of the water.